That was the title of a newspaper article my Uncle Marvin wrote about fifty years ago. It might not be fall quite yet, but we can tell it's just around the corner. Over at the homeplace I turned the A/C off yesterday evening and opened the windows. Amy and I sat on the pizer enjoying the late afternoon tranquility. As I write, the temperature is in the mid 70s. And the humidity is low. It's wonderful. If you're planning to visit this weekend I believe you're in for a treat. Stop by and say hello. This month's newsletter is a story of Captain Joe Burrus, last Ocracoke lighthouse keeper before the beacon was electrified and automated. You can read it here. Life is slowing down some this week. I believe all of the islanders are breathing a long sigh of relief. But then again, Labor Day is just ahead. Anyway, it is quieter right now.....and the weather is super. A bit cooler, but sunny and simply delightful. I went for a walk on the beach. Saw a few folks far down the beach, but only passed one couple. The water was gentle and clear. And warm! It was just about perfect, I'd say. This summer Fiddler Dave put a bug in my ear. He suggested developing a self-guided island tour. Lou Ann & I thought that was a splendid idea. After a couple of months of research and hard work we have created two brand new historic tours. Unlike the ghost walks, these tours are all about history, stories, and local anecdotes. They are wonderful introductions to Ocracoke island and are recorded and uploaded to MP3 players. This means you can rent them at your convenience and enjoy the stories as you walk or bike through the village. They are designed for folks who are new to Ocracoke as well as those of you who have been visiting the island for years. Take a look at our web page for more information, including frequently asked questions. Just click here. Early yesterday morning the heavens opened up. Looking out my bedroom window I saw the trees dancing in the wind. It looked like a hurricane; the rain was driven sideways. By the time I stepped out onto the front porch the storm had mostly passed by, and wide, deep puddles lay in Lawton Lane. We needed the rain. The island has been so dry that a pickup truck almost got stuck in my parking area. Years ago, before the municipal water system, islanders would have been desperate for rain as cisterns went empty or nearly so. There would have been no frivolous wasting of precious water, so there would have been no baths. What a welcome relief to have rain. Visitors often ask about our small island school. Classes resume today with four new teachers -- Gill Williams (counselor), Stephen Wolfe (high school math teacher), Ann Borland (media assistant), and Claudia Moote (pre-kindergarten teacher). We welcome these new members of our community. Ocracoke school is served by a total of 20 teachers, 3 instructional assistants, a SIMS coordinator, a guidance counselor, a maintenance worker, a secretary, and a principal. 119 students are enrolled this year, in grades K through 12. Ocracoke school often faces unusual challenges. This year, from January 1 to the middle of March, all seven of the bridges between the campground and the pony pen will be replaced, and the road will be closed (click here for more information). The park service plans to open a beach access ramp near the pony pen. During this time the athletes, coaches, & parents will need to use the beach when going to, and returning from, four games. Parents and other community members will be enlisted to carry students and coaches along this section in their four wheel drive vehicles. This is just one more reminder of the unique challenges we face living on Ocracoke island. We've published yet another Ocracoke newsletter. this month we share a few stories about Captain Joe Burrus, last keeper of the Ocracoke lighthouse before it was electrified and automated. You can read the story here, along with a few photos of the inside of the lighthouse. A death in a small community affects everyone. In August Ocracoke has had more than its share of funerals and memorial services. Yesterday family and friends gathered to celebrate the life of native islander, Ray Thomas Waller. Earlier this month island fisherman, Dave Burley, died, as did Helen Pentz, owner of the Harborside Motel and Gift Shop. Just days ago John Thomas O'Neal, one of the founding members of the Ocracoke Assembly of God, died in a nursing home off island. His funeral will be on Sunday at two o'clock. Our condolences to all family members and friends. Our latest Ocracoke Newsletter is the story of the Black Squall, a brig loaded with circus animals that wrecked on Ocracoke in April of 1861. You can read it here. 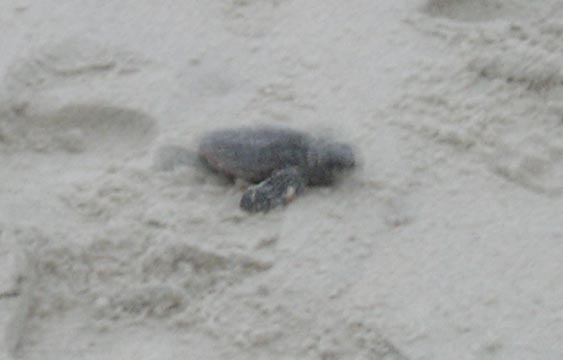 Yesterday evening Amy took Lachlan to the beach for the release of five newly-hatched loggerhead turtles. 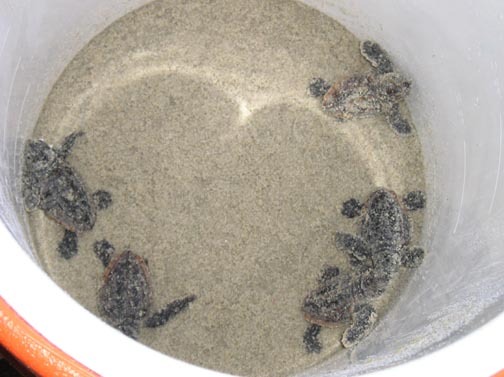 They were brought to the release point in a round cooler by a park ranger. After being set free three headed straight for the surf and were swimming away in less than five minutes. One was confused and wandered a bit in circles before being redirected. The fifth needed help negotiating footprints and other ridges in the sand. No flash photos were allowed so as not to confuse the little guys, but we hope you enjoy the pictures above. We wish them all well on their often hazardous journey to adulthood. ....to call Ocracoke home. This morning I took Lachlan with me as I ran a few errands. I stopped at the Variety Store for a few items and laid them on the counter. Tammy, the clerk, had rung them up just as Lachlan darted off with an impish grin on his face. I knew he was up to no good, so I pulled out my wallet and handed it to Tammy, explaining that she should just take out what I owed, and I'd be back as soon as I corralled the little devil. When I returned, the gentleman who had been standing behind me looked at me with an astonished expression on his face. "I guess you wouldn't have done that wherever you come from," I offered. "Not on your life," was his reply. It's nice to know you can trust folks. And that's just one more reason I like calling Ocracoke home. Before 1840, without regular mail service (or telephones, or ferries, or any of the other modern communication and transportation marvels) islanders had little contact with the outside world. Sailors would periodically return from the West Indies or New England with stories, but mostly the news was old and out-dated. The establishment of a post office helped keep Ocracokers connected to the rest of the country. Today the post office is often the place to keep abreast of island goings-on (we don't have home delivery). The bulletin board is full of posters and notices (what's for sale, what the church or youth center is offering, addresses of those in the hospital, etc.). And it's where we stop and chat about the latest community events. The post office is a regular stop for anyone wanting to stay in touch here on the island. This is from the "For What It's Worth' department. If you look in a shell book you will learn that conchs and whelks come in "right-handed" and "left-handed" varieties. 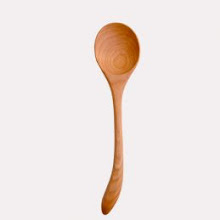 The right-handed ones, like the one pictured below, are more common. These have the opening on the right side as you look at the bottom of the shell. Interestingly, Ocracokers always referred to these shells the other way around. 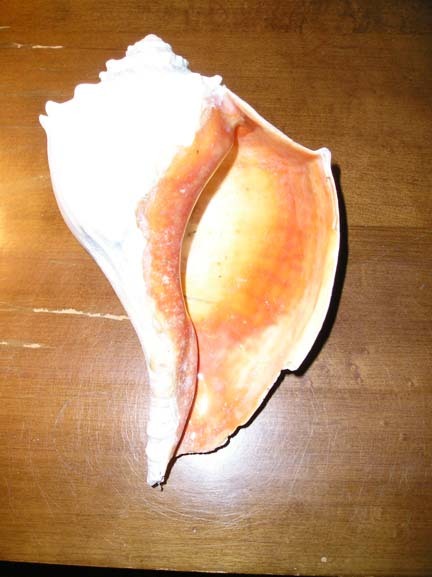 In other words, the shell below is a left handed conch. The reason -- years ago, when these large shells made perfect dippers for getting water out of the cistern (every home had at least one large conch lying on the cistern) they were designated by the hand you would use to pick up the shell/dipper. The shell below was just right for a left-handed person. Thus it is a left-handed conch. So who's right? The books or the O-cockers? Depends on who you ask. On the island we still call this a left-handed conch. I suppose a day off on Ocracoke is not much different from a day off anywhere else (except for a walk on the number one beach in the US). Today I enjoyed a leisurely breakfast, read a bit, then fell asleep in my hammock. After lunch I messed about in the front yard (all of the plants are doing well with the exception of one rose bush). I did walk over to my office to process payroll and work on a new project, but that didn't take too long. Then it was off to the beach. The humidity has been low these last few days, so the sun didn't seem oppressive. The water was warm, but refreshing, as always. After a shower I'll amble over to Amy & David's for supper. It will be fun to play with Lachlan before I head back home to continue with my latest book, and then call Lou Ann. If you live on Ocracoke Island summer is the time for friends . This week I had visits from several long-time off-island friends. Clay Walthall and his wife, Julie, stopped by on Wednesday. Clay is an artist and potter. You can see his work in our gallery. His lighthouse prints are quite unique and you can see them here. While we were chatting around the kitchen table after the Opry show John Golden, folksinger and guitarist, came by. John would be spending the night. You can read about one of John's CDs here. Other family and friends have been stopping by also. It's a time to catch up on friends' lives and goings on. On this date in 1899 Ocracoke islanders experienced one of the worst tropical storms on record. Winds reportedly reached 120 mph, and flood tide washed through the village and into homes and businesses. Boats were scattered and significant damage resulted. However no lives were lost. Some years later one islander was heard asking, "Now, that old August storm.....it struck in September didn't it?" A reader left a comment a couple of days ago -- Roy Parsons' PO Box number is 1. (Roy Parsons, PO Box 1, Ocracoke, NC 27960.) I haven't seen him the last few days, but I don't think his health is good. I know he would appreciate cards from some of his Opry fans. Elizabeth is planning a simple birthday gathering tomorrow at 7:30. I understand that friends are invited to just stop by, visit a bit, and have cake and ice cream. Another reader asked for photos of our new "garden." Well, frankly, it's just a few plants in the front yard, and I've had a time keeping everything watered. It has been so dry this summer, and one of the rose bushes is struggling. And the grass needs to be cut! So I think I'll wait until things slow down a bit, the weather cools off, we get some rain, and the yard starts looking a little better. In the meanwhile, if you're walking down Lawton Lane glance over the fence and you'll see the beginnings of some color and greenery. Once Lou Ann is here year around it will look more like a proper garden. I know it will! Ocracoke needs rain. These last few weeks we've occasionally had gray clouds scudding by, and even some rumblings off in the distance, but precious little precipitation. Hardly enough to make a short-lived puddle. So I've been watering our new plants and bushes. Most of them seem to be thriving in spite of the heat and drought. Lou Ann did her research and chose plants well adapted to sun and dry soil, and even tolerant of salt water. We'll see about that. For visitors (and lucky islanders), however, these last few weeks have been perfect beach weather. Warm water, gentle waves, and lots of sun beckon nearly everyone to the surf. For all of our readers who know Roy Parsons (island native, onetime vaudeville performer, engaging storyteller, Opry regular, model boat builder, and much more) -- Roy has had health problems of late. I visited him several days ago and he was having trouble breathing. Once settled on his sofa he recovered and was soon back to his old self, asking about old timers, sharing stories, telling jokes, rhyming his sentences. He was wearing one of his cowboy shirts. But I doubt if he'll be back on stage this season. He is mighty frail. Roy's birthday is this Saturday. I think he'll be 86 or 87. You might want to send him a card. I know he'd appreciate it. I don't know his PO Box, so just send it to Roy Parsons, General Delivery, Ocracoke, NC 27960. Or, if you're on the island, stop by Pamlico Gifts and tell Elizabeth you'd like to say a few words to Roy. He enjoys company. .....it went. A streak of white light following a moving dot in the star-studded night sky. Everyone saw it. There were oohs and aahs from the assembled crowd. More were to follow, but none as bright and as long-lasting. But they came with regularity. Above the big dipper. Across Cassiopeia. Following the curve of the Milky Way. One after another. From different directions. Each one spectacular in its own way. Even without the meteor shower the sky over the beach would have been outstanding last night. Somehow the Milky Way seemed brighter and more majestic than ever. A cloudy river of stars, it called for wonder and amazement. Even the layman knows more than Newton knew about the multitude of stars, galaxies, and nebulae. About the vast distances. The enormity of empty space. Black holes. The speed of light. Distant solar systems. An expanding universe. Planets that might harbor life. And the deepening mystery. Lying there on the beach, gazing up into the richness of space, I was humbled. It may be the only response possible. Summer may not be over, but Lou Ann's family and work were calling her back to Indiana. She starts back to school tomorrow. I drove her to Norfolk late Friday. Her flight was early on Saturday morning. She didn't want to leave....and I didn't want to see her leave either. We had such a wonderful summer. Didn't get to the beach as much as we would have liked (it is our busy season, of course), but we performed at the Opry, led ghost & history walks, enjoyed birthday parties and pot luck dinners, entered the July 4th parade, entertained family & friends, planted a garden, listened to island music, and sat on the pizer in the moonlight and enjoyed each other's company....and much more. We're already planning times to get back together....on the island, in the Midwest, and places in between. On Friday afternoon I went to visit Roy & Elizabeth Parsons. Lou Ann had been there just the day before. Roy is having health problems, and enjoys the visits. Elizabeth asked about Lou Ann. Told me I had a good woman. I agreed. Then she looked me in the eye and said, "She's one of us." It was about the nicest thing she could have said. I agreed again. Last night Lou Ann, Lachlan, & I went to the beach. We took a chair so Lou Ann & Lachlan could sit in the bed of the pickup truck (once we were on the beach, of course). Lachlan took off through the soft sand as soon as I stopped and he touched down. We rinsed him off in the surf (he was covered with mint chocolate chip ice cream). We laid a blanket down in the sand, but, alas, there were no stars. The sky was grey and bleak. We had hoped to catch some of the early shooting stars from the Perseids meteor shower. (The big night will be on Sunday.) It was getting late, so we packed up and rode back into the village. We made a stop at the lighthouse after realizing that Lachlan may never have visited the lighthouse in the dark of night. The soft beam cut through the mist and haze, casting a surreal glow on the keeper's quarters and the grounds. It felt comforting, and even a little bit creepy, all at the same time. Lachlan decided it was time to go back home....so we did. A quick post today -- not much time to do more than that: Tonight Lou Ann and I will be taking Lachlan to the beach to look for shooting stars. If we see some we'll let you know. "I understand Earl O'Neill has finished a new book with information about the Howard family on Ocracoke. Will the Village Craftsmen be selling it? Thanks." Earl has, indeed, published his new genealogical book. It began as a genealogy of the Ocracoke Howard family, but, since we are so interrelated, Earl soon learned that he had to expand the scope of the book to include the Jacksons, Garrishes, and Stowes in order to make his book comprehensive. It turned out to be more than 700 pages! To obtain a copy of the book (if I remember correctly the price is about $70.00), please contact the author directly: Earl W. O'Neal, Jr., PO Box 698, Ocracoke, NC, 27960. This book is quite remarkable. The genealogies run from page 1 to page 451. The remainder of the book includes copies of documents, wills, photos, maps, and stories. This is a major contribution to the history of Ocracoke Island. Thank you Earl! Ocracoke is one of those places where night can, at times, be truly night. Most Americans live in developed areas with street lights, porch lights, automobile headlights, and lights from nearby windows. Of course, Ocracoke has its share of "light pollution." But every once in a while I am reminded of the deep darkness that characterized an island night a half century ago. Last night, at about 11:30 pm, Lou Ann and I left Gary & Kitty's house on our bikes. The darkness was almost complete. Although I know the lane well, after only a short distance I found myself off the pavement and in the sand. Lou Ann gave up on riding almost immediately and decided to walk her bike. I followed suit. Before long we found enough light to re-mount our bikes. There was even sufficient ambient light down Howard Street. But I was saddened that our species has so conquered the night that it is rare to experience the inky blackness of midnight. A hundred thousand years ago the ocean level stood twenty meters, or seventy feet, above its present level. About 80,000 years ago the sea began to drop. Sea level stopped falling -- about 50,000 years ago.....No Outer Banks and no elbow capes occurred along the Atlantic coast of North America because there was no gentle slope on which they could form. About 12,000 years ago more ice began to melt at the edges of the glacial ice caps than accumulated on them. Sea level began to rise.....With sea level rise, the Outer Banks formed.....First spits, then islands, then elbow capes developed. About 3,500 year ago....sea level rose very rapidly to a point about two meters....below its present position. Since the year 1800 sea level has come up at least thirty-five centimeters, or fourteen inches. As sea level rises, the positions of the elbow capes and barrier spits and islands will change. No matter what man does, there will be Outer Banks. Consider reading the book. Its subtitle is "The Amazing Convergence of the Ocean & the Outer Banks." I'm sure Leslie carries the book at Books to be Red on the School Road. We just can't seem to stop celebrating birthdays. Lachlan and I (along with Lou Ann, Amy, David, Julie, Pat, Steve, and others) joined Katie Wharton (and her husband John & other friends) for Katie's August birthday celebration last night. We arrived at the Cove B & B at 6:30 for another pot luck dinner, cake & ice cream. Lachlan not only knows about blowing out the candles, of course; he is also quick to pull the candles out of the cake to lick them off. After dinner we sat around the table and told stories, laughed, and carried on until everyone was ready to head home. The beach and books. They seem to go together. There are always folks on the beach, sitting in lawn chairs, under an umbrella, absorbed in their latest book. Those of us who live on the island don't have as much free time in the summer for reading, but do get to curl up with a good book every now and then. Right now I am reading American Prometheus: The Triumph and Tragedy of J. Robert Oppenheimer. Oppenheimer was the "father of the atomic bomb." It is a fascinating book. Maybe our readers have suggestions for some of their favorite books, or even their favorite summer read. Leave us a comment if you'd like. And pleasant summertime reading! Yesterday we had a quiet, and very satisfying, birthday celebration. My brother came down to the island and the whole family went to the Flying Melon for lunch. At 4 in the afternoon we shared cake and creme puffs (thanks to David and Amy), then Lou Ann, Bud, and I headed to the Back Porch for dinner (I highly recommend the Bourbon Pecan Chicken). After dinner we walked to Deepwater Theater to catch a Molasses Creek performance. We arrived very early (it was barely 7 o'clock). One young man was already there, sitting on the deck reading the latest Harry Potter novel. He explained that last year he came too late, the performance was sold out, and he missed the show. He was taking no chances. We were wanting to go back home for a while, so I explained that we didn't want to miss the show either, and asked the young man if he would purchase three tickets for us. He agreed, and I handed him $45.00. As I walked away I thought, "Where else but Ocracoke would I talk with a total stranger for five minutes and then hand him $45.00, and fully expect to get my tickets when I came back?" Sure enough, when we returned he handed me the three tickets......and $30.00. "What is this about?" I asked. "You gave me $75.00," he said. "This is your change." It turns out that I had handed him a five, a twenty, and a fifty; not a five and two twenties. I thanked him and we took our seats. After the show I stopped him and his family to tell them how fun it was to watch them enjoying the music and stories (the show was fabulous, and these folks were so animated....laughing and smiling and singing along). And then I told his parents about his honesty and that they had obviously "taught him right." "Look for the story on my journal," I told them. So today's post is a tribute to Frank and his family, wonderful island visitors -- the kind of folks who make you feel good just to be around them. Come back and visit often! It is a lovely warm morning on the Island. We were awakened early by the morning bird calls and the lazy shadows welcoming us to a new day. And a wonderful day, at that! Today is Philip's birthday which is shared with his grandson, Lachlan! Lachlan was born in the pre-hurricane frenzy three years ago. I had planned a grand party on the Windfall as a surprise for Philip. The hurricane and the new baby dashed those plans. I moved the time and location for the party at least four times! After Alex came ashore and shared his fury, I took the cake down to the Red Cross Station where local folks gathered and wished Philip a Happy Birthday while picking up bologna sandwiches! Today is calm and quiet, so it looks like gardening and beach walking will be on his agenda today. Just wanted you to know so that you could drop Philip a note or two of good wishes. David's parents stopped by this morning. They are visiting for several weeks and staying at Amy & David's. Lachlan was with them and they were heading for the school playground. Lachlan enjoys the slide and the swings. And the school and playground are only a short walk down Howard Street. Today is absolutely beautiful -- clear skies, & a slight breeze. I think "Grammy" & "Bump-Bump" may take the little guy to the beach later today. I wish I weren't working!